I know I said I didn’t need more fabric Your Honour. I know, like a nerdy anorak type with his CDs in alphabetical order, I am going to have to sort my fabric into categories of colours because I have so much of it. But it is ‘Les Soldes’ in France and, unlike the U.K., they do not have an ongoing sale all year round. The sales are on specified dates for a specified time and so one must, of course, make the most of them. That is the case for the defence. I am just practising for when Mr. Tialys (aka ‘The Prosecution’) returns and wants to know why yet more of the soft stuff has appeared in the house. I actually have a very good excuse for buying the cream cotton with the tiny white flowers. 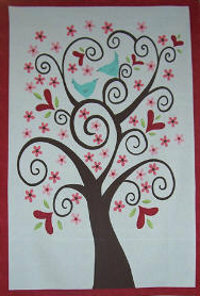 I am using it in a quilting project as a background fabric so it makes financial sense to buy it when it’s in the sale. The gorgeous striped linen on the bottom had 50% off and, although I have no idea what I want it for yet, half price is half price. The Liberty is Liberty and is beautiful and that’s all that needs to be said. I can’t tell you how much fabric I’ve got stashed away but, strangely enough, when I decided I wanted to get started on making a quilt for my daughter’s 18th (well over a year away but I don’t want to rush it!! ), I decided I didn’t have anything quite right. I want to make something she’ll like now but also in years to come. 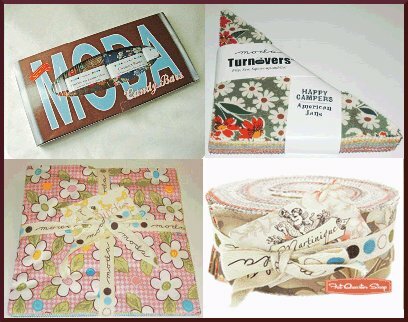 She likes the fabrics in this jelly roll and says they will also remind her of me – bless! – so I’m going to use those with this panel from the same fabric range in the centre. I’ll decide on the backing and quilting pattern later. The three fabrics on the bottom are nothing to do with the quilt but I can’t resist a bit of text so ordered them at the same time! I like covering buttons – I find it therapeutic. Call me strange. I have been amusing myself today by covering some huge buttons with gorgeous fabric and then thinking of ways to use them. When I went to Toulouse last week, I went into La Droguerie which is a fantastic little shop hidden away in one of the many back streets of Toulouse and which I only ever find again by accident. This was the first time I have ever been into the shop and actually managed to get served. The problem is that they sell all different little, teeny things like buttons, ribbons, embellishments, beads, charm, jewellery findings and yarn that they have to make into skeins while you wait so each person takes an age to be served and those that are waiting (usually me) lose the will to live and leave with nothing but bitter memories. Not last week though! We got in very late as we were going to have dinner there and so only caught the last 40 minutes or so of the shops. I went in and there were sales staff to spare. I sent my husband off to the nearest bar as, unaccountably, he doesn’t seem to be interested in beads and buttons, and went all unnecessary as I tried to grasp the fact that I was actually going to be served and desperately tried to think of all the things I could possibly need and want which, of course, is not the same thing at all. I knew I wanted some maribu feathers to make angel wings – don’t ask! – but what else? Anyway, I spotted these huge buttons and they’d covered them in some gorgeous Libertys of London fabric. Had to have them – well, actually, they were charging a fortune so had to make them. They didn’t sell the blank buttons but I fell in love with the fabric with teeny, tiny cars on it and paid a fortune for a small piece and, I’m ashamed to admit, I lied to my husband about the price. He wouldn’t understand. How Gorgeous is This Fabric? Now, I must stop playing and get on with something more serious – not as serious as ironing or housework of course, but I’ve only got 10 blank buttons and I don’t want to use up all the fun at once. I don’t know why but I love using text in my items. There’s just something so eyecatching about it and I think it always makes an item look more interesting. I especially like text which is incomprehensible (to me anyway) such as Greek or Latin or Russian. I’m not so keen on Japanese or Chinese text as it looks more like a design than letters so it’s not the same thing. I do some hand stamping but this only suits certain fabrics and items. Maybe I’ll have to learn screen printing . 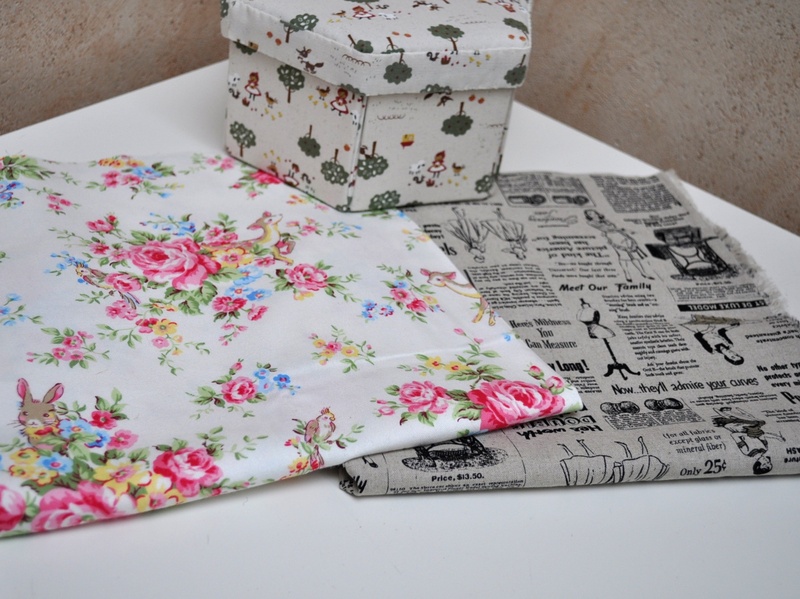 I’ve just made a cushion cover from a printed linen panel, backed with floral linen and it features a French love poem. My French isn’t perfect but I think there are some errors on there! Still, the thought is there and you can tell it’s supposed to be romantic. I am on a quest. It is really difficult to find fabric featuring text. 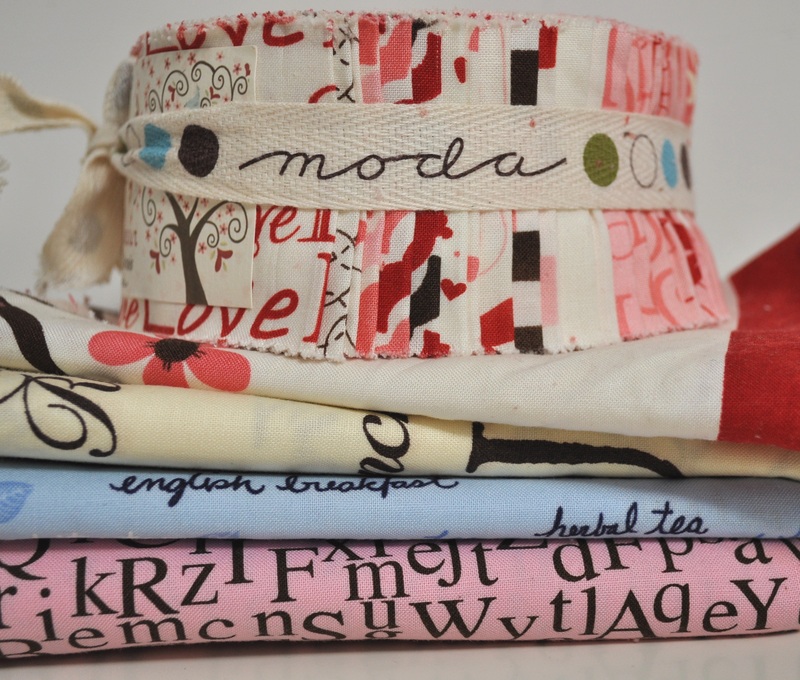 I am badgering my friend Anna to include some text when she starts up her own fabric range but I am impatient! If anybody comes across any, can you let me know? 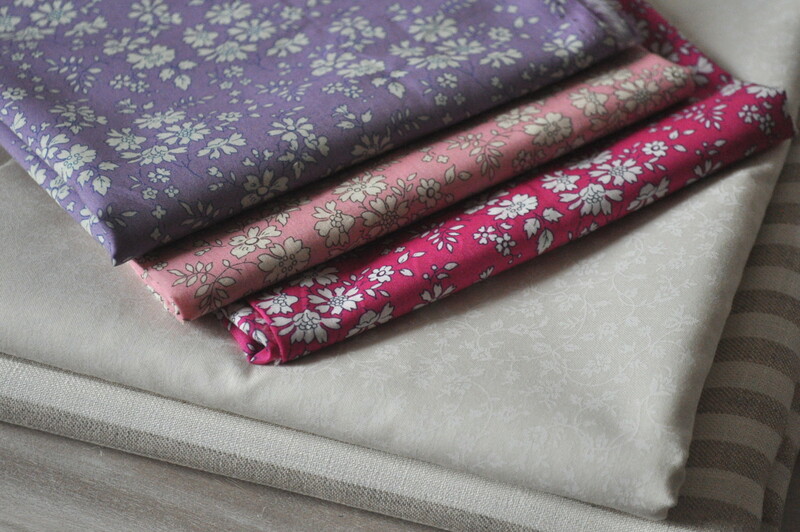 I am always looking for all kinds of fabric and I don’t see that much so I know it’s difficult. For preference, I would prefer linen but good quality cotton will do. I look forward to receiving the results of your investigations and thank-you in advance. Just received this package from Sue in Florida – it cost her over 26USD to send which is one of the reasons I’m not going to participate every month – the postage here in France is really expensive. Anyway, great stuff. I love the sand dollar – I don’t think I’ve ever seen one before. Also, there were some sharks’ teeth. Apparently there are loads to be found on the beach where Sue lives. She also sent me a postcard explaining the legend behind sand dollars. Each line, pattern and hole represent something to do with Christian imagery, apparently. As the swap is supposed to include fabric and chocolate, I asked Sue to send me some Hersheys as that is SO American and, despite having been there several times, I’ve never tried it. A bit disappointing really – probably why you don’t see it anywhere else. Maybe I’m spoilt living in France (although my favourite is still Cadbury’s dairy milk – how sad is that?). Anyway, I’d never seen dark chocolate m&ms before so that was a bit different.